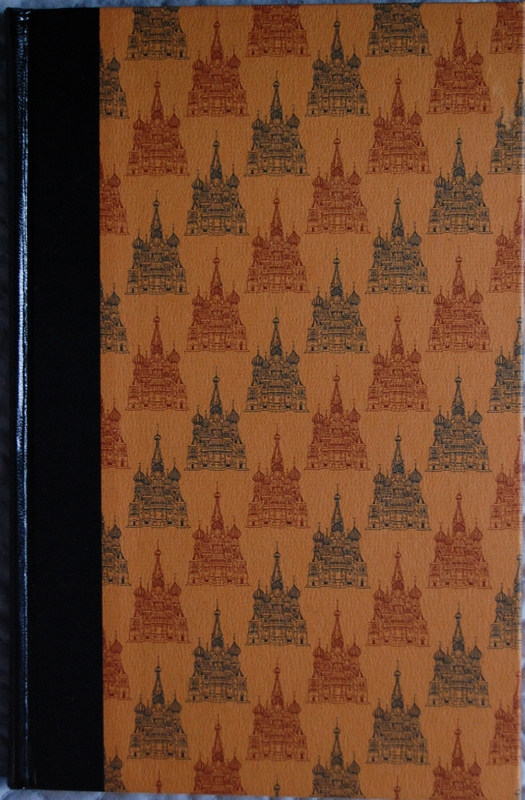 Front Binding – The Heritage edition of Eugene Onegin is quite a looker. The boards feature a recreation of the Cathedral of SS. Peter and Paul done by Fritz Eichenberg, which were then taken to Martin Weber, a man who invented a process called “repeat-patterns” via camera to duplicate the image multiple times. Sounds straightforward to us today, but remember that this was before Xerox machines or computers! Russell-Rutter’s Frank and William Fortney performed the binding in New York. 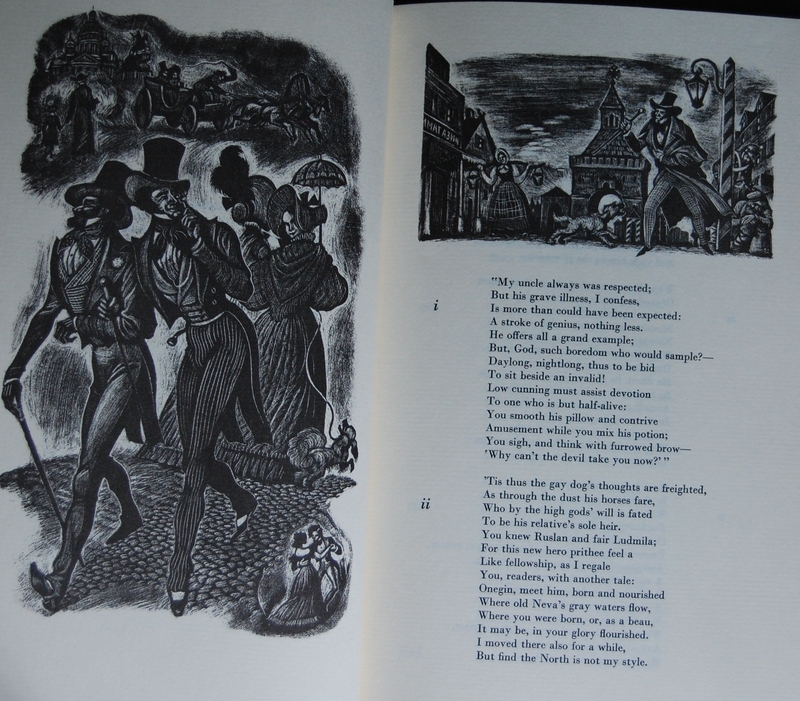 Title Page – Alexander Pushkin’s first work to be printed by the Limited Editions Club (and later reprinted by the Heritage Press) is this fine poetic novel Eugene Onegin, arguably Pushkin’s most renowned work – The Golden Cockerel would follow in 1949 (with famous book artist Edward Dulac providing the art there), and The Captain’s Daughter and Other Stories would arrive in 1971, with Charles Mozley doing the artistic honors. 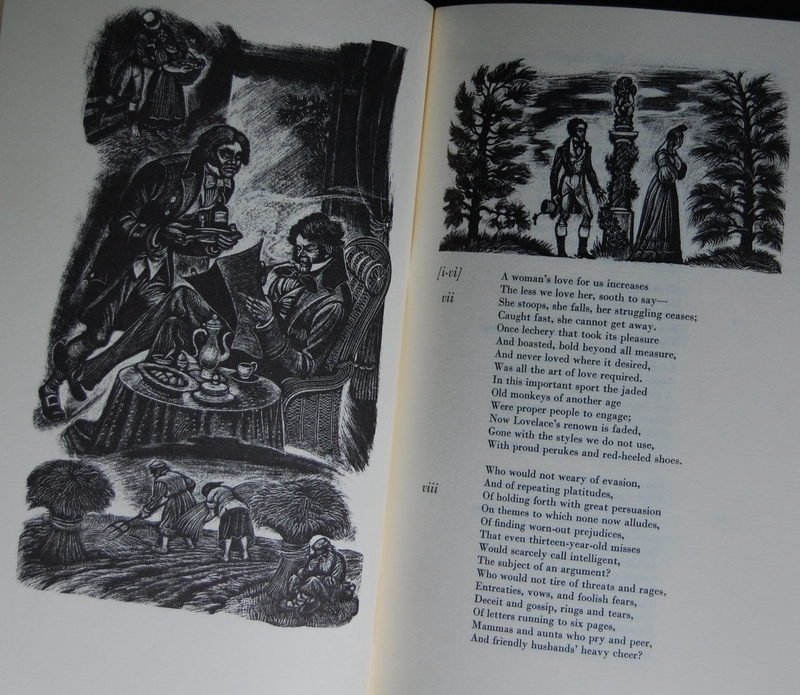 For this particular book, Fritz Eichenberg was commissioned to create lithographic prints for his first assignment for the Club, and this definitely stands as one of the finer achievements in his brilliant career. The art is this book is incredible. But we’ll get to that shortly – let’s run through the other important figures behind the book. 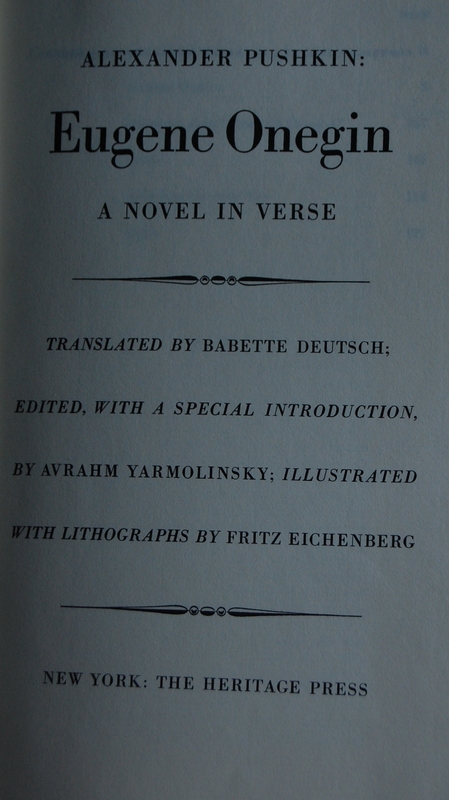 Pushkin’s Russian text was translated into English by Babette Deutsch, a poet and critic whose work on this book was quite notable. She was married to the editor/introducer of this book, Avrahm Yarmolinsky, who served as the head of the New York Public Library’s Slavonic Division for three decades. Not a bad team, I’d say. 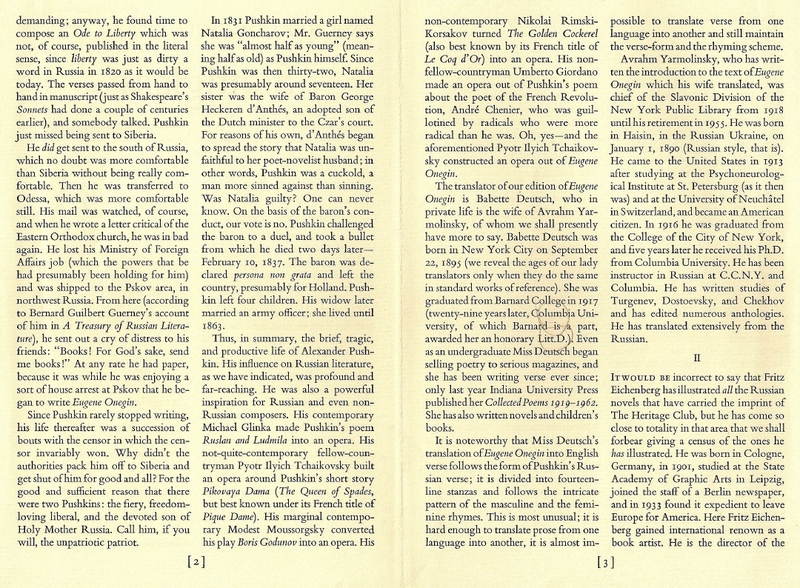 The text is Bodoni’s Monotype, printed in New York by Robert Bederson on paper made for the book by the Strathmore Paper Company. 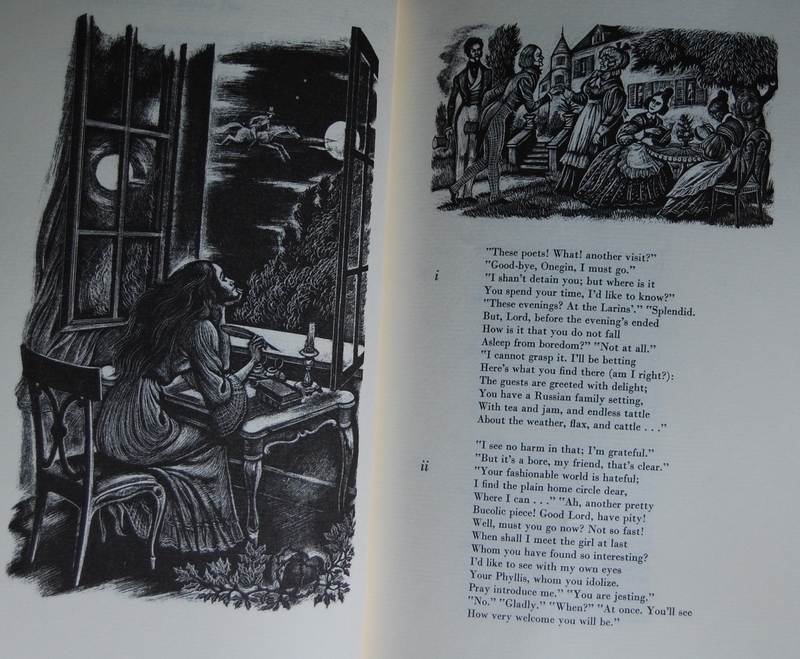 Pages 4 – 5 – Eichenberg’s stunning lithographs begin each chapter in this dramatic fashion, further cementing him as one of my favorite illustrators of all time. His style clicks so well with this book. Pushkin himself is considered one of Russia’s finest (if not the finest) poets, and founded modern Russian literature during his lifetime – I’d like to hope he’d be pleased with the fine treatment Eichenberg did on this particular book. George Macy had George C. Miller and his son Burr Miller handle the printing of the lithographs. 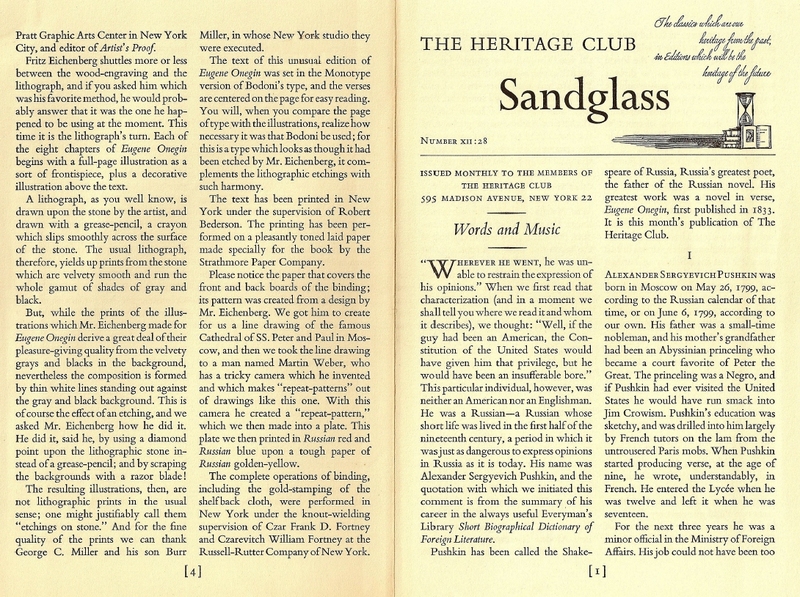 You’ll find a lovely description on how the lithographs were made and set to print in the Sandglass below, courtesy of Librarything’s kdweber. Much thanks! Pages 43 – 44 – I may have to declare this one of the greatest pieces in any Macy book. I adore this illustration on the left. Personal Notes – Checked out through my library system at first, I added it to my own collection in 2011 thanks to Bookbuyers in Monterey. I traded a heap of incomplete Heritage Press books for credit to get this and many others, and I’m really happy to own this one. Alas, there’s a rather annoying price sticker on the slipcase that will destroy it if I attempt to remove it…*sigh* I do want the LEC original, as it’s a beauty. 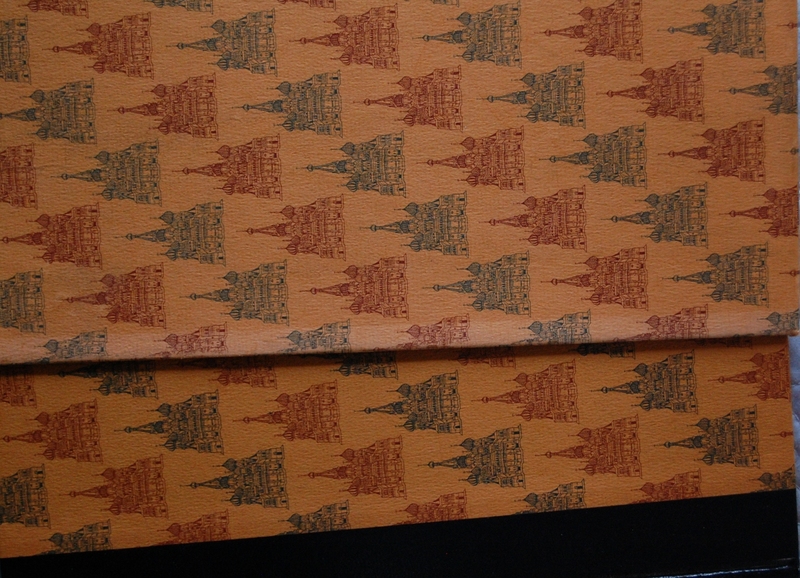 You are currently reading Heritage Press: Eugene Onegin by Alexander Pushkin (1943) at The George Macy Imagery.